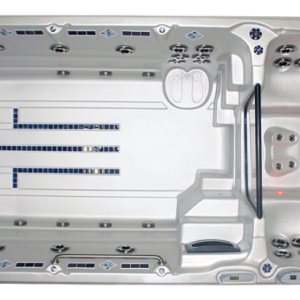 A swim spa offers advantages over both hot tubs and swimming pools. Compared to a hot tub, they are larger and have more many more uses. Compared to a swimming pool, you can swim in place ‘endlessly’ without making flip-turns, and the small footprint makes it easier to maintain and more environmentally friendly. Yet you can still relax after a long day and let the stress melt away. And kids love to play in the swim current. A swim spa offers the best of both worlds for pool and hot tub lovers!